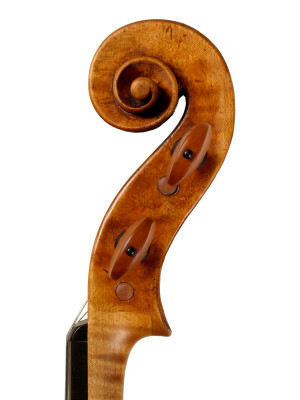 The ‘Spagnoletti’ Amati of c. 1683 is named after Paolo Ludovico della Diana, known as ‘lo Spagnoletto’ (c. 1765–1834). At the age of 12 Paolo entered the Naples Conservatory. He must have been an accomplished performer, for in one popular anecdote the apparent prodigy sightread his exam repertoire with the music upside-down! Paolo later worked as a court violinist in Spain, a seemingly natural placement given the Spanish court’s longstanding preference for Cremonese instruments and Italian musicians. Upon his return to Italy, his Italian colleagues dubbed him ‘lo Spagnoletto’ (‘the Little Spaniard’), a moniker which he adopted for posterity. Around 1802 an Italian tenor named Vagnoni heard the violinist in Milan and was so impressed that he brought Spagnoletti to London. There he worked as assistant concertmaster and later concertmaster to the King’s Theatre Orchestra for over 30 years. By all accounts he gained a reputation as a superb orchestral leader and Nicolò Paganini is said to have expressly requested that Spagnoletti be engaged as the concertmaster for all of his London performances in 1831. Spagnoletti is also acknowledged as one of the founding members of the Philharmonic Society of London. 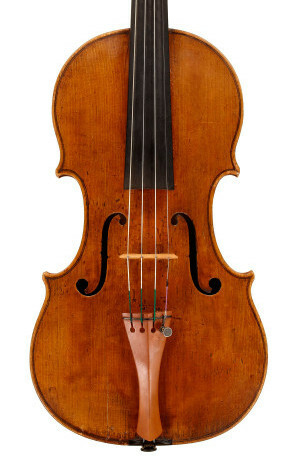 The ‘Spagnoletti’ Amati bears a label dated 1663 but is more accurately dated to roughly 20 years later and, as with many late Amati workshop violins, shows the collaboration of Nicolò’s son Girolamo II.